Ex-H!P Egg, ex-Ongaku Gatas member, currently preparing for a solo debut and doing Berikyuu's opening! Well there's not that much history to be discussed, but any expectations from her career? :3 And ain't she cute! I am really excited to see how her solo career will kick off! I hope she debuts soon like this summer! SHAMELESS MANOERI BUMP OF LOVE. I am really excited about how solo career. I think a fresh new and young soloist is just what H!P needs. We haven't seen a younger soloist in years and Manoeri definitely has all sorts of potential. A lot of haters are saying that she's not ready or not quite "talented enough." I am glad she's perfect. Part of the fun of following idols is watching them grow. If Manoeri started out as some amazing soloist prodigy, she would get really old really fast. 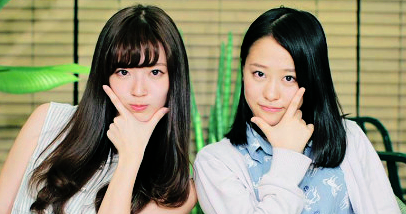 I look forward to see her come into her own style and mature just like all the rest of the H!P soloists. Zigg and I are gonna miss her moments with Nocchi but she's been given an opportunity and I don't think she would have been given something like that if she didn't have the potential. She already showed us that she has talent when she was in OG so I think she has a bright future ahead as a soloist. I certainly hope Mano increases her energy in performances. "Under the beautiful blue sky"
She has potential, hope the management will use it wisely. Yay for delurking! Good bug!! Support your favorite group, buy CDs, DVDs and merch. Shimizu Saki and Yajima Maimi are the MCs. I want an Erina keychain! And gosh, she just keeps getting more gorgeous, doesn't she? Look at her in those handshake official pictures! Erina + Captain + Maimi = best combo ever. I'm digging the t-shirt myself! 'Manopiano' was really cute, but I agree~ they need to give her a proper debut! Page created in 0.381 seconds with 19 queries.